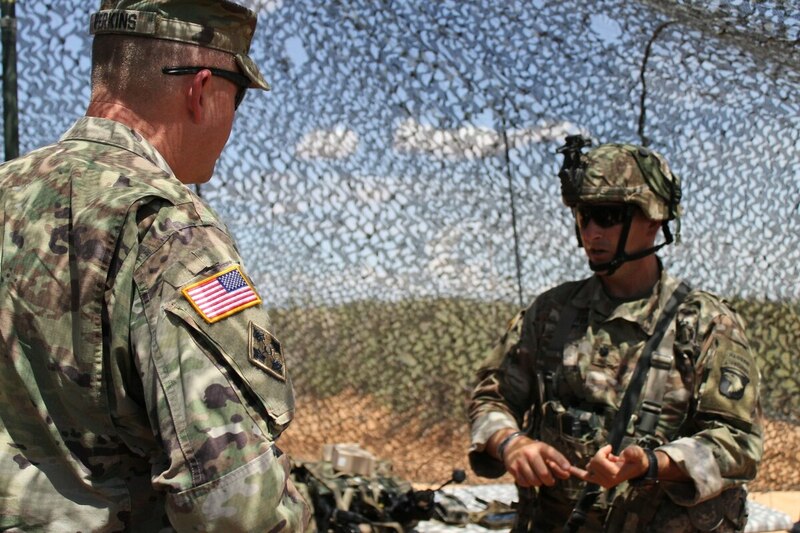 FORT BLISS, Texas — For the new light infantry unit conducting the Network Integration Evaluation at Fort Bliss, Texas, smaller, lighter and more mobile systems that don’t inherently make soldiers enemy targets due to heat and electromagnetic signatures are on the wish list for future system iterations. Several of the systems under test at the NIE — a two-week evaluation that occurs annually — are lighter, smaller and more nimbler versions of previous capabilities, which makes the fact a light infantry unit is putting them through the paces appropriate. But even though many of the systems have significantly reduced in size, more work could still be done to lessen the load on the soldiers using them. Up until this year, NIEs have been conducted using a designated, full-time heavy armored brigade unit, and so the Army drastically switched up how the systems would be tested by choosing a very different unit to take over. The service decided it would no longer be able to dedicate the 1st Armored Division’s 2nd Brigade Combat Team as the full-time NIE unit because of an increased demand for armored capability, particularly in Europe. The Army therefore chose the 2nd Brigade Combat Team, 101st Airborne Division from Fort Campbell, Kentucky, to conduct the NIE this year held in July. An air assault unit spending two weeks in the desert outside of El Paso offered a drastically different perspective from a heavy unit that had become used to the pace and process of testing in such a location. The unit was tasked to put to the test the Warfighter Information Network Tactical Increment 2 (WIN-T Inc. 2) system on a Humvee — known as the Tactical Communications Node-Lite (TCN-L) — and while WIN-T has been under fire for being too cumbersome and vulnerable, the reviews of the TCN-L at the NIE tended to be favorable. Previously the WIN-T node — essentially the Army’s tactical network — required a 5-ton vehicle and could not work unless the vehicle was stopped. Now WIN-T’s TCN-L is able to stay connected on the move and can be sling-loaded onto the battlefield using a CH-47 Chinook helicopter. The unit got the system into combat operation within 23 minutes at the NIE. However, the next evolutionary step would be to get WIN-T into something even smaller like an ATV or even a man-carried version, “because every vehicle we have out there, every time we set up our tactical positions out here, we create a signature that the enemy can use to find our location,” he said. A 2nd BCT operations officer, Maj. Timothy Chess, told Defense News that when WIN-T was in a Light Medium Tactical Vehicle a ladder was needed to access the equipment, and now it consists of one flat panel at waist-level for easy access. Most of the equipment is virtualized now so it saves space, and the air-conditioning to keep the system cool doesn’t have to push as hard, so overheating isn’t the issue it used to be. Chess said the only thing he’d change would be to add extra pre-configured server spares because now “if it were to crash, it would pretty much bring down this whole side of the network.” A server swap would only take about 30 minutes, he noted. The unit also evaluated several concepts and capabilities to include the Mobile User Objective System (MUOS) on a Manpack radio with a digital fire mission processing system. The Army was required to deliver MUOS-capable Manpack radios by this year. MUOS is a U.S. Navy network — comprising four geosynchronous satellites and ground stations in Hawaii, Virginia, Italy and Australia — that uses cell phone technology to connect tactical communications around the world. The Manpack is the ground link to the MUOS satellite, sending messages that can travel in less than half a second over 100,000 miles. Brig. Gen. Joel Tyler, the director of the Joint Modernization Command, said at the NIE that soldiers “have really taken to” to the MUOS capability. “We have been getting beyond-line-of-sight over the MUOS pretty reliably,” Carter added. He noted he was able to continue communications with his company commanders while being jammed on FM radio by switching to MUOS to extend communications range in the contested environment. However, the capability being loaded into an existing PRC-155 Manpack radio was not particularly preferred, according to several users out at the NIE. A few soldiers suggested it might be better off in a vehicle-mounted configuration. Carter told U.S. Army Training and Doctrine Command Commander Gen. David Perkins, as he toured the unit’s set-up in the desert, that while the MUOS capability was good, the platform it’s on is “suffering from some severe limitations from battery consumption,” and was roasting in the heat, reaching roughly 270 degrees in rucksacks. With the radio on a soldier’s back, it’s basically making that soldier a target to the enemy due the heat signature and the electromagnetic signature because the radio is always retransmitting, Carter said. The other issue is the Manpack with the MUOS capability makes a soldier’s kit weigh roughly 130 lbs. And the battery life is an issue, requiring soldiers to carry 72 batteries for a couple of radio systems over a 24-hour mission. The MUOS antenna could also be hardened, one soldier said about the system, as one of them snapped off coming out of an air operation. The unit also worked over the course of two weeks to accelerate the amount of time it takes to relocate Tactical Operations Centers out in the field in austere environments. The TOCs require the unit to be extremely mobile to keep the enemy from finding its electromagnetic signature and therefore its whereabouts. The unit jumped the field artillery TOC several times during the NIE. It took 18 hours to set it up the first time, Tyler noted. But in the early part of the second week, the unit moved it and had it set back up within two hours. So Carter used the NIE to put the network and communications systems under evaluation, and its entire set-up to the test in one of the most stressing environments for such capability. Carter also streamlined the TOC and didn’t place it far forward on the battlefield. He opted to strip the TOC of non-essential battle staff such as personnel and logistics officers. That created a smaller footprint in the TOC and took less time to pack and move. Perkins noted, while inside an NIE TOC, that it was time to move away from the “TOC Mahals” used during the wars in Iraq and Afghanistan. And a hard look should be taken to determine what capability is needed in the TOC for what missions. 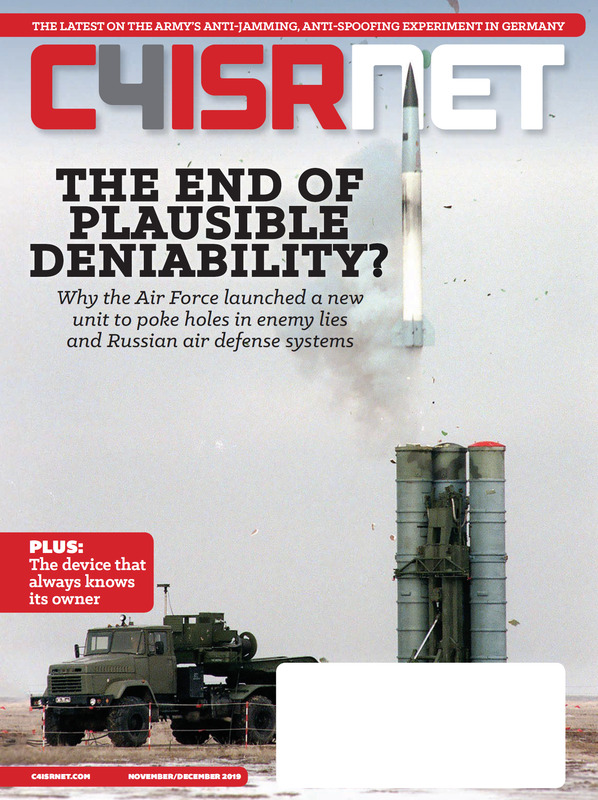 For instance, the Distributed Common Ground System-Army systems provided to the unit during the evaluation were completely packed up because the unit fried two server stacks and the systems were having significant problems operating “in this level of austerity,” Carter said. DCGS-A “is a great capability for at the strategic level; it provides this huge capacity for analysis, but I need about this much of it,” Carter said while miming peering through a narrow tube. The NIE was also a good opportunity, according to Carter, to really think about TOC survivability on a modern battlefield. “Is this a thing that is real anymore, or do we need to be completely mobile and like basically expand the TAC concept into an LMTV that just drives around and provides mission command?” he contemplated for Perkins during a TOC tour. At this point, since all of the unit’s mission command equipment is powered by air-conditioning and the server stacks need to be kept cool, the TOC, as it is, still seems necessary, he concluded. “So survivability of the machine is driving the survivability of the TOC,” Perkins said.